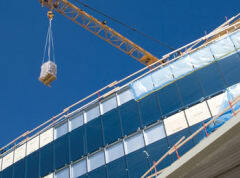 In the construction industry in the US, falls are the leading cause of worker fatalities. Each year, on average, between 150 and 200 workers are killed and more than 100,000 are injured as a result of falls at construction sites. Since we began work records, construction is the industry that carries the most concerns about height for employees. Accident reports show common situations where falls from height occur and illustrate that these events are usually due to poor management control, rather than equipment failure. OSHA has revised its construction industry safety standards and developed systems and procedures designed to prevent employees from falling off, onto, or through working levels and to protect employees from being struck by falling objects. The performance-oriented requirements make it easier for employers to provide the necessary protection. The rule identifies areas or activities where fall protection is needed. These include, but are not limited to, ramps, runways, and other walkways; excavations; hoist areas; holes; formwork and reinforcing steel; leading edge work; unprotected sides and edges; overhand bricklaying and related work; roofing work; precast concrete erection; wall openings; residential construction; and other walking/working surfaces. The rule sets a uniform threshold height of six feet (1.8 m), meaning that construction employers must protect their employees from fall hazards and falling objects whenever an employee is at or above this level. Protection must also be provided for construction workers who are exposed to the hazard of falling into dangerous equipment. The OSHA rule clarifies what an employer must do to provide fall protection for employees, such as identifying and evaluating fall hazards and providing specific training. Requirements to provide fall protection for workers on scaffolds and ladders and for workers engaged in steel erection of buildings are covered in other subparts of OSHA regulations. • Control lines also must be connected on each side to a guardrail system or wall When control lines are used, they should be erected not less than six feet (1.8 m) nor more than 25 feet (7.6 m) from the unprotected or leading edge, except when precast concrete members are being erected. In the latter case, the control line is to be erected not less than six feet (1.8 m) nor more than 60 feet (18 m), or half the length of the member being erected - whichever is less - from the leading edge. Controlled Access Zones, when used to determine access to areas where overhand bricklaying and related work are taking place, are to be defined by a control line erected not less than ten feet (3 m) nor more than 15 feet (4.6 m) from the working edge. Additional control lines must be erected at each end to enclose the controlled access zone. Only employees engaged in overhand bricklaying or related work should be permitted in the Controlled Access Zones. On floors and roofs where guardrail systems are not in place prior to the beginning of overhand bricklaying operations, Controlled Access Zones should be enlarged as necessary to enclose all points of access, material handling areas, and storage areas. On floors and roofs where guardrail systems are in place, but need to be removed to allow overhand bricklaying work or leading edge work to take place, only that portion of the guardrail necessary to accomplish that day's work should be removed. • Have sufficient strength to withstand twice the potential impact energy of an employee free falling a distance of 1.8 m, or the free fall distance permitted by the system, whichever is less Personal fall arrest systems must be inspected prior to each use for wear damage and other deterioration. Defective components must be removed from service. Dee-rings and snaphooks must have a minimum tensile strength of 5,000 pounds (22.2 kilonewtons). Dee-rings and snaphooks should be proof-tested to a minimum tensile load of 3,600 pounds (16 kilonewtons) without cracking, breaking, or suffering permanent deformation. • The rope, wire, or chain should be attached to each stanchion in such a way that pulling on one section of the line between stanchions will not result in slack being taken up in the adjacent section before the stanchion tips over Warning lines should be erected around all sides of roof work areas. When mechanical equipment is being used, the warning line should be erected not less than 1.8 m from the roof edge, parallel to the direction of mechanical equipment operation, and not less than 3 m from the roof edge perpendicular to the direction of mechanical equipment operation. When mechanical equipment is not being used, the warning line must be erected not less than 1.8 m from the roof edge. 6. Covers Covers located in roadways and vehicular aisles must be able to support at least twice the maximum axle load of the largest vehicle to which the cover might be subjected. All other covers must be able to support at least twice the weight of employees, equipment, and materials that may be imposed on the cover at any one time. To prevent accidental displacement resulting from wind, equipment, or workers’ activities, all covers must be secured. All covers should also be colour coded, or bear the markings ‘HOLE or ‘COVER’. When guardrail systems are used to prevent materials from falling from one level to another, any openings must be small enough to prevent passage of potential falling objects. No materials or equipment except masonry and mortar should be stored within 1.2 m of working edges. Excess mortar, broken or scattered masonry units, and all other materials and debris should be kept clear of the working area by removal at regular intervals. During roofing work, materials and equipment should not be stored within 1.8 m of a roof edge unless guardrails are erected at the edge, and materials piled, grouped, or stacked near a roof edge must be stable and self-supporting. When toeboards are used as protection from falling objects, they must be erected along the edges of the overhead walking/working surface for a distance sufficient to protect persons working below. Toeboards should be capable of withstanding a force of at least 50 pounds (222 newtons) applied in any downward or outward direction at any point along the toeboard. They should be a minimum of 9 cm tall from their top edge to the level of the walking/working surface, have no more than 0.6 cm clearance above the walking/working surface, and be solid or have openings no larger than 2.5 cm in size. Where tools, equipment, or materials are piled higher than the top edge of a toeboard, panelling or screening must be erected from the walking/working surface or toeboard, to the top of a guardrail system's top rail or midrail, for a distance sufficient to protect employees below. • Employees’ role in fall protection plans Employers must prepare a written certification that identifies the employee trained and the date of the training. The employer or trainer must sign the certification record. Retraining also must be provided when necessary. There’s no doubt that training is of central importance where it comes to establishing safe work practises at height, but creating the infrastructure for this is a factor employers cannot afford to ignore. Many elements need to weighed into the balance, from choosing appropriate fall protection systems to conducting a thorough risk assessment in the first place - and they all need to be weighed before one of your employees loses his balance and falls. It is hoped that the essentials to this vital process outlined in this article will go some way to reducing fatalities from such falls.